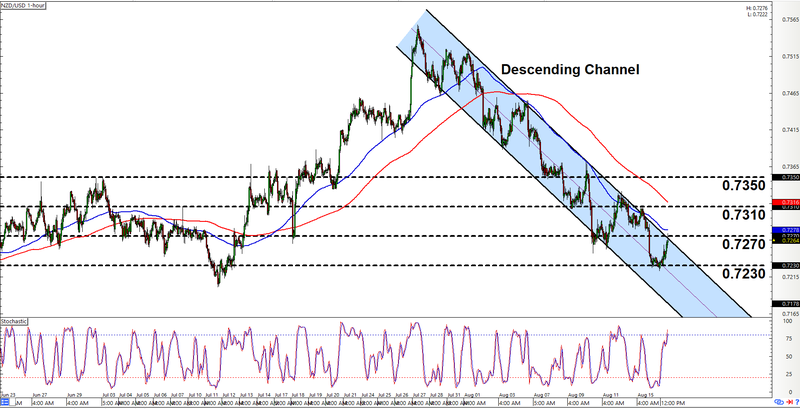 For today’s intraday charts update, we’ll be taking one of our usual strolls down memory lance since we’ll be checking up on our old setups on GBP/USD and NZD/USD. And as always, we’ll be lookin’ for fresh plays as well. If y’all can still recall, we found that there descending triangle on GBP/USD’s 1-hour chart chart way back on August 10. And back then, we were expecting the pair to hit 1.2900 first. But as y’all can see, the pair reached all the way to 1.2850 before hesitating, so congratulation on bagging 210 pips, if you were able to ride this pair down. Aww, yea! We got bank, dawg! Anyhow, we’re still bearish on the pair. After all, we were also expecting the pair to reach 1.2810 next. However the pair appears to be hesitating already, so there’s a chance that the pair may pull back first before resuming its downward push. And using our handy Fibonacci tool, we can see that all retracement levels look like good candidates for a pullback. 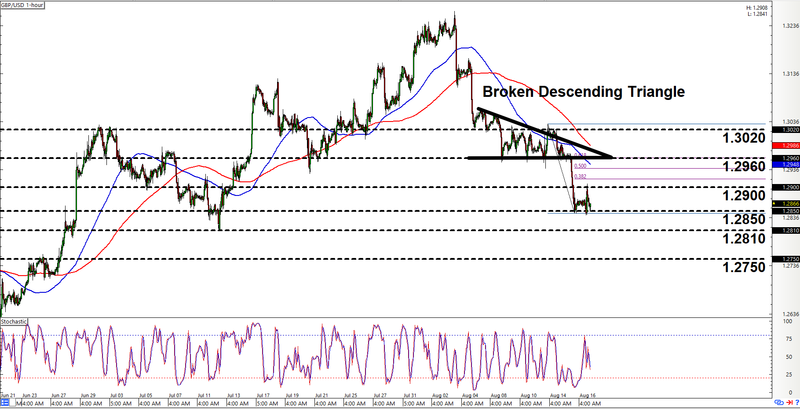 However, the 61.8% retracement level seems to be the key level to watch since it lines up with the broken support at 1.2960. In any case, whether the pair pulls back first or smashes past 1.2850, then them bears will likely be gunning for 1.2810 and 1.2750 next. We found that there descending channel back on August 11. And back then, the pair was testing the channel’s resistance area at 0.7310, so we were lookin’ to go short on the pair. And as y’all can see, 0.7310 held as resistance and the pair slid 80 pips lower to 0.7230. So congratulations if you were able to bag some pips from this setup. Aww, yeah! The pair is currently testing the channel’s resistance again, which happens to be 0.7270 this time around. Also, stochastic is signaling overbought conditions and all that. As such, y’all better start lookin’ for opportunities to go short again. However, y’all be extra careful this time around since the pair failed to test the channel’s support area before moving back up again, which is a sign that bullish interest may be strong. This also means that an upside channel breakout is a probable scenario, so y’all may wanna make plans for that as well, especially if the pair clears 0.7310 and 0.7350.